I've been working on the back-end of this blog more than you might realize. I'd already adjusted the HTML to allow for continuity breaks for long posts, and done some organizational tweaking on an ongoing basis. 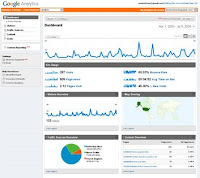 Several months ago, I installed the HTML code to allow for data acquisition via Google Analytics. This lets me know how many people are visiting, which pages are most popular, wh ere my visitors are from, etc. Is this overkill, especially for a blog that only gets ~60 visitors a month? Sure it is, but without the Analytics data, I'd have no real notion of any visitors at all: who, how many, from where, new vs. returning, anything at all. I *hate* operating in the dark. A big thing that I've finally figured out is how to screen out my own visits from the data stream. Oh, such a trivial matter, you say? Surely your own visits to post, edit or tweak won't skew the data that much, you say? Why not just guess, estimate or ignore your own visits, you say? Actually, for an obscure blog like mine, my own visits were messing up the data more than I was comfortable with. So, I think I've finally fixed that. A trivial accomplishment for the CodeFu Masters among us, but a reasonably big step for me. Incidentally, I think this is no small matter for the WordPress vs. Blogger debate. One of the selling points of WordPress is the visitor data you can accumulate, which Blogger does not automatically provide. However, Blogger lets you manipulate the HTML of your blog to a much greater extent. A prime example is the installation of Analytics, which AFAICT gives much finer grained visitor data than WordPress provides. Anyone who uses WordPress, care to chime in? WordPress is vastly superior to Blogger in several ways, such as creating and editing actual posts. For hit stats, though, WordPress bloggers just use SiteMeter. And if a WordPress blogger really wants hard-core stats, they host their own WordPress blogging software (see http://wordpress.org/. Blogger, out of the box, does stats better. From an authoring perspective, WordPress is lends itself to content creation. However, WordPress does not have anything as cool as "Follow Me" with the icon grid. Thanks Anthony, this is interesting info. So far, I haven't run into any show-stopping limitations with Blogger for content creation. My entries have been fairly basic, with limited graphics or embedded active widgets, etc. Perhaps my needs are just unusually simple at this point. Maybe I'll set up a testbed on WordPress, just for the educational value. Hi, I'm with Anthony, it's WP all the way for me. I have google analytics installed through a plug-in, so have access to all that provides - but it is installed on my own domain so I don't know how it works if you don't want that. But by far WordPress is so much more user friendly for commenters, sometimes I don't leave comments on Blogger blogs as I just don't have time to go through all the fuss, and some lock out the easy name plus URL option for people like me. Drives me batty! I'm finding that WordPress enables my blog to grow with me - back when I started it I had no idea where it would go, now I'm podcasting, using a WP plugin. That scalability is just too good to beat. Absolutely - that's probably the most important point, Emma, making it easy for people to interact and leave comments. Unless someone suddenly gets slammed with trolls and spam, I don't see the logic in making it hard for people to post comments, by making it members only, or restricted lists, etc. In fact, to facilitate this, I've just turned off the captcha for my blog. If it becomes an issue for autospamming, I'll revisit the issue. I know I read that Blogger will allow you to do podcasting. I just put up a new post with an audio file link, as a little test. It only took a few minutes to figure out... am I missing something?